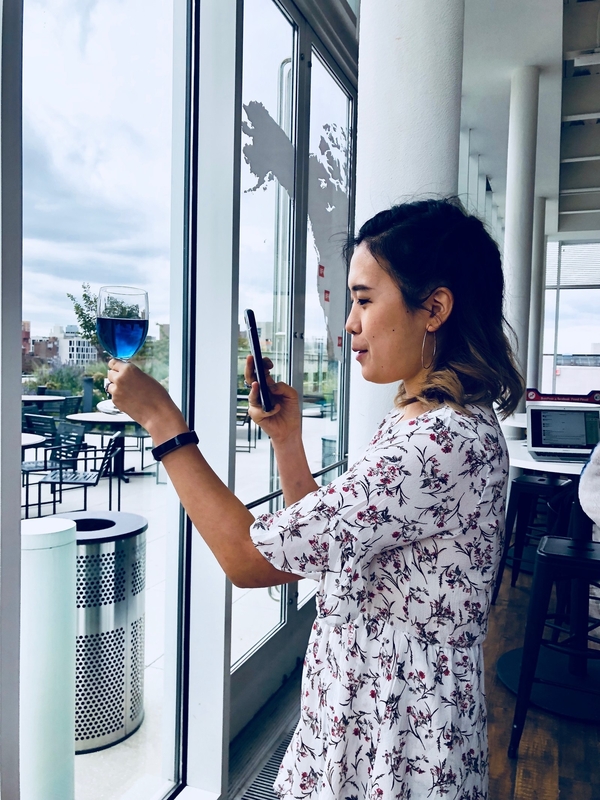 Blue Wine Is Totally Instagrammable, But Does It Actually Taste Good? In the good old days, there were just three types of wine: red, white, and rosé. But today, wine comes in almost every color of the rainbow. In fact, you've probably seen crazy wines (like this alarming blue one) popping up all over your Instagram feed. Then in the midst of everyone's obsession with activated charcoal food (remember those black ice cream and black hamburger buns? ), we even saw black wine having a moment in the spotlight. And you probably thought drinking rosé during the summer was cool... until you saw people had already moved on to orange wine. 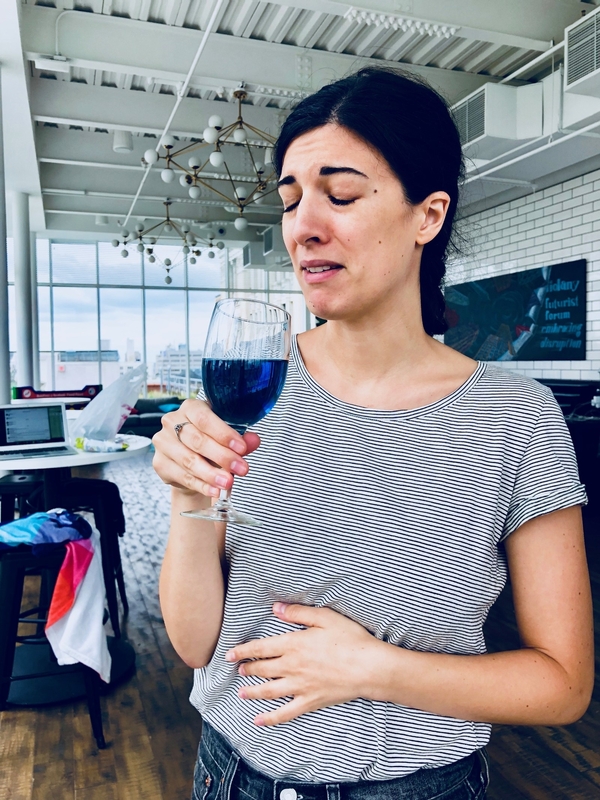 So I obviously had to see what all the fuss was about, and I enlisted the help of three colleagues to help me taste test these three wacky colored wines. Hannah: I'm obsessed with wine. I wouldn't say that I'm a wine snob, but I'm definitely a bit picky about what I like to drink, and Trader Joe's Two Buck Chuck doesn't cut it. Marie: I’m French and grew up in Bordeaux, so I ~should~ know a lot about wine. Unfortunately, I don’t and my wine expertise is limited to the good old “does it taste good?” test. Michelle: When I was in college, I lived off two-buck chuck. Now, I’m the person who always picks the rosé out of every wine menu. #sorrynotsorry. Jesse: "I was forced to study wine during culinary school for three painful weeks — soils, geography, etc. I was so bad at it. I'm still so bad at it. I struggled to get a C in the class. Needless to say I'm no expert." I remember reading about Gik's blue wine, which is produced in Spain, a while back when it was only available in Europe. But it recently made its way to the US. Whether or not we can even call this blue stuff "wine" is up for debate. According to the official website, Gik starts with red or white wine grapes, then they add two organic pigments: "Indigo and anthocyanin – which comes from the very skin of the grapes used to make wine." Well, our reactions looked a lot like Amy Poehler's. The wine smelled very sweet, and it tasted offensively sugary and totally unnatural. Jesse: "It looks like blue gatorade. This tastes like some gross wine you’d steal out of someone’s garage as a teenager." As a disclaimer, black wine isn't really black. It's made totally naturally from red grapes in Cahors, France and Saperavi grapes in the Republic of Georgia. Think of it as the darkest red wine you've ever seen. According to one of my favorite wine blogs, Wine Folly, this wine from Cahors was already called black wine in the Middle Ages due to it's dark purple, almost noir hue. The wine looked very dark, and it tasted more or less what you'd expect it to taste like: Very full-bodied and chock full of tannins (which just means your mouth feels super dry immediately after taking a sip). Jesse: "This is a bull-dozer of a wine. I can see drinking it with a steak with cream sauce." Michelle: "This is definitely a hangover wine." Marie: "Yeah, I'd have a headache if I drank one glass of this." (But TBH, that could be a result of the quality and price point of this particular bottle). Hannah: "I definitely don't hate this wine. If you served me a glass on a cold winter night with a hearty meal, I would happily drink it. But it needs to be the right time and place." Finally, it was time to taste the orange wine. Orange wine has become popular recently, especially as an alternative to rosé. And to dispel any myths, orange wine isn't made from oranges, nor is it made from a specific grape. As sommelier Madeline Puckette writes on her blog, Wine Folly, orange wine is made by leaving the grape juice in contact with the grape skins during the wine-making process. The result: A uniquely orange-hued wine. You can find orange wines from all over the world, but Italy, Greece, Georgia, and Slovenia are some of the bigger producers. The orange wine looked and tasted unique. But what was the consensus? Jesse: "This sort of tastes like the ocean." Michelle: "I don't hate it. There's a real dryness to it though." Marie: "No, I don't like this." (While she shakes her head in a very French display of disapproval). Hannah: "It's OK. This particular bottle is a bit on the sweeter side, which I don't love. It reminds me of rosé except with more body and more tannins." Blue wine is the devil. Avoid it. If you like hearty, full-bodied red wines like Cabernet Sauvignon and Malbec, give black wine a shot. If you want to try it, look for Argentinian red wines in addition to wines from Cahors, France. "Georges Vigouroux Pigmentum 2014" is a good value bottle to start with. If you love rosé and are interested in expanding your horizons, take a chance on orange wine. There's a big price range, but you can easily find something in the $10-$15 dollar range. For something affordable and delicious, "Paleokerisio" Dom. Glinavos 2016" is a semi-sparkling orange wine from Greece worth trying.